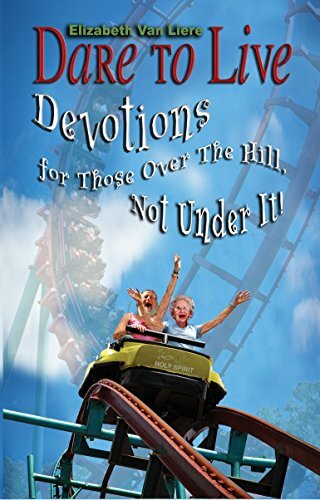 Dare to Live: Devotions for Those Over The Hill, Not Under It! is a jolt of spiritual inspiration, a quick boost for your soul. Rediscover God’s grace, hope, and power for living-regardless of your place or age in life. In Dare to Live 87-year-old author Elizabeth Van Liere leads readers through a thirty-day journey to a fuller understanding of what it means to “season slowly with a mighty and loving Savior.” This journey pursues a life characterized by relevancy not regret, generosity not grumpiness, and compassion to the end. When her husband of forty-five years died at the end of 1991, Elizabeth helped their daughter raise four young sons. Now at age eighty-seven, she still finds time to travel, visit her four adult children, ten grandchildren and “almost fourteen” young great-grandchildren. Elizabeth’s articles, poems, children’s stories and devotions have appeared in periodicals for some sixty years.